His emotional and youthful voice touched the hearts of many, especially the lovers in all walks of life. He was an incarnation of a Saint who descended upon our island to sooth the emotions of people who seek the true meaning of love. Milton Mallawarachchi thus boldly took us all on an exploration of 'True Love'...to an extent where no other local singer has taken us before or after. 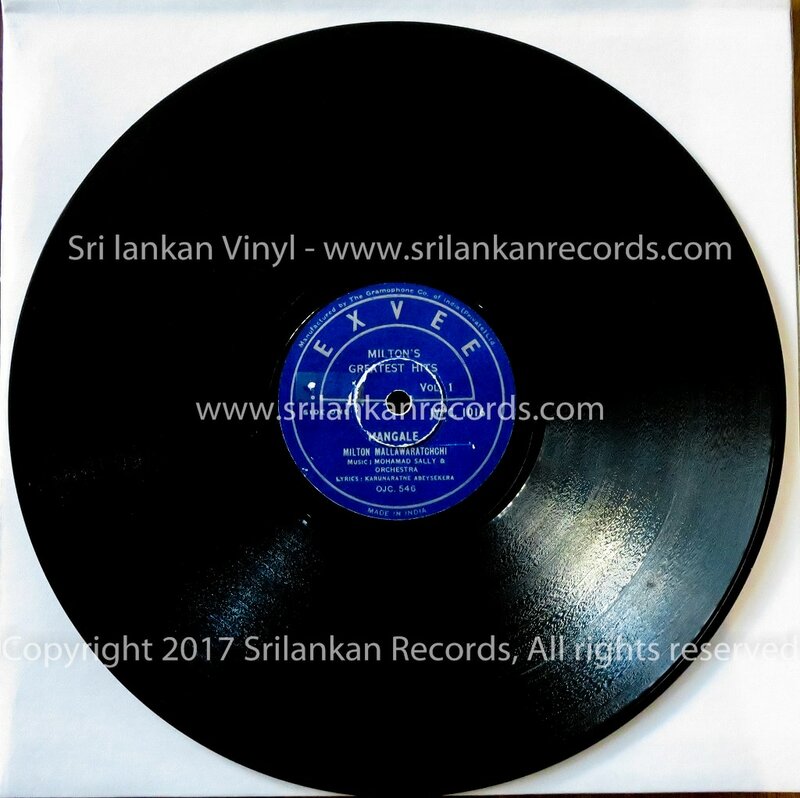 The song Ran Kooduwa oba Sadoo... Milton sang for his very first Gramophone record depicts the voice of a disheartened young lover who had been deserted by his girlfriend. One would end up in tears if he or she listens to this song in a fitting context. This was the 'Magic' in Milton Mallawarachchi's voice. Milton gifted his fans an array of similar songs such as Sithum Pathum podi Adarae, Sanda uthura Gangawe, Pem Rajadahane(with Rukmani Devi), Upul Nuwan Vidaha , Ae.. nowe.. Ma soya..Peminiye.. Kisidine.., over a career span of three decades. He was the guardian angel of young lovers to whom he offered a shoulder to weep on when they are in dismay. It all began when Milton together with the late veteran Herbert Ranjit Peiris, formed a group called 'Shakyans' and performed in small get-togethers. While Herbert played his harmonium in 'Paduru parties', young Milton used to sing popular songs of that time including Hindi numbers and in the process, his vocal chords were tested perfectly. Subsequently, he had a stint with the group 'La Ceylonians' with Noel Ranasinghe. A recording engineer called Mervi Rodrigo played a significant role in Milton's singing career. He introduced young Milton to Patrick Corera who offered him to record four songs for an LP, which were Oruwaka Pawena, Sansara Sewanella, Mangale Neth and Ran Kooduwa. Oruwaka Pawena became an evergreen hit. The late Karunaratne Abeysekera and Mohamed Sali did the lyrics and music scores. Patrick Denipitiya with his mesmerizing melodies created a new phase in Milton's singing career. He along with Clarence Wijewardena gave a western touch to Milton's songs. Milton's voice perfectly harmonized with the melodies created by this duo. The duet Samanala Raenak Sae.. Milton sang along with Indrani Perera for the film Senakeliya was one of the most romantic film songs ever recorded. 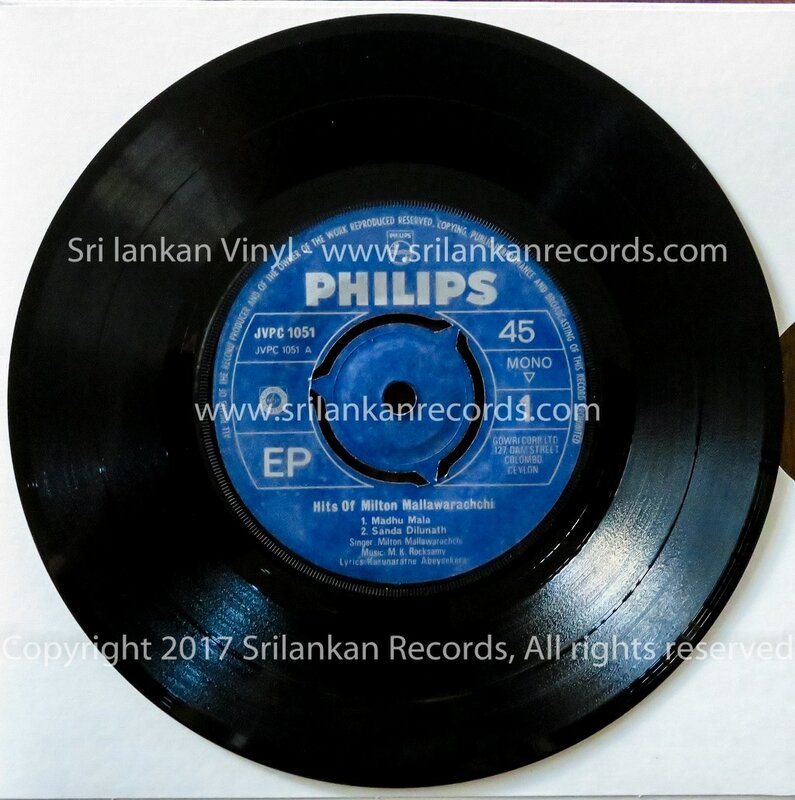 Patrick Denipitiya was the melody maker. Melroy Dharmaratne and Victor Ratnayake too created novel melodies for Milton. In an era sans television, Milton created pleasant visuals in his listeners' minds with his highly emotional and gushy voice. He paid careful attention to lyrics and rehearsed the songs many a time, before going for final recordings, giving light to true professionalism. 70's decade was the golden era in Milton's singing career. In 1971 Milton sang for the film Pujithayo. Sarath Dasanayake and M K Rocksamy the divine musicians with film director Sena Samarasinghe identified the credible screen voice of Milton's and offered him to sing for Gamini Fonseka in an array of films. These film songs such as Vikasitha Pethuman(Asha Desin) , Nilla Nagana (Nilla Soya) , Tharu Paya Akase (Yali Hamuwennai), Aeka kali(Hindi)(Syril Malli) became super hits. Milton was the only singer who could rub shoulders with Jothi to sing for Gamini. 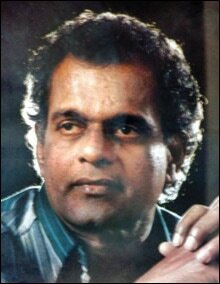 Renowned filmmaker Dr. Lester James Peiris honored Milton by offering him the song Upul Nuwan Vidaha in his film Ahasin Polowata. Over a period of three decades, Milton had sung over 100 film songs and had over 1000 songs in his kitty. He clinched the Sarasaviya award for the best playback singer in 1984 for the song Kendan Yannam in the Sena Samarasinghe film Aethin Aethata. Priya Sooryasena and Gretien Ananda sang this too in the film. Milton never performed abroad as a principal. A young super star contestant in television singing Uyanak piri pipi mal.. ada parawela...wihangun gayu geewel...ada nethi wela...echoes in my mind. Milton with his demise had created a void in our lives. 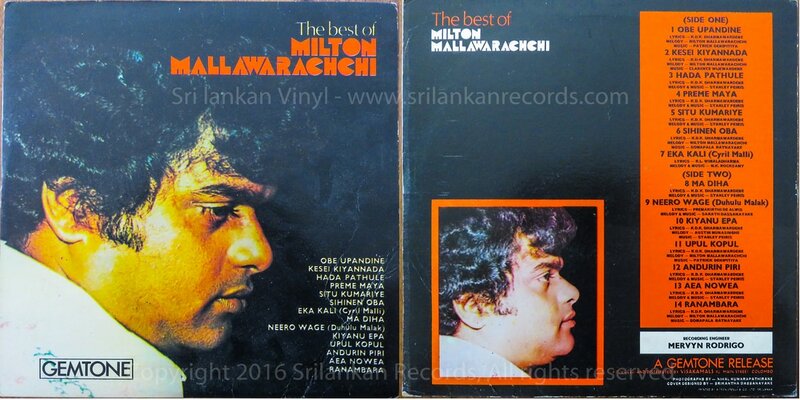 Milton Mallawarachchi the divine singer will be remembered as the 'Prince of Romance' in the hearts of Sri Lankans forever. Thanks to Channa Bandara Wijekoon and extracted from Daily News. 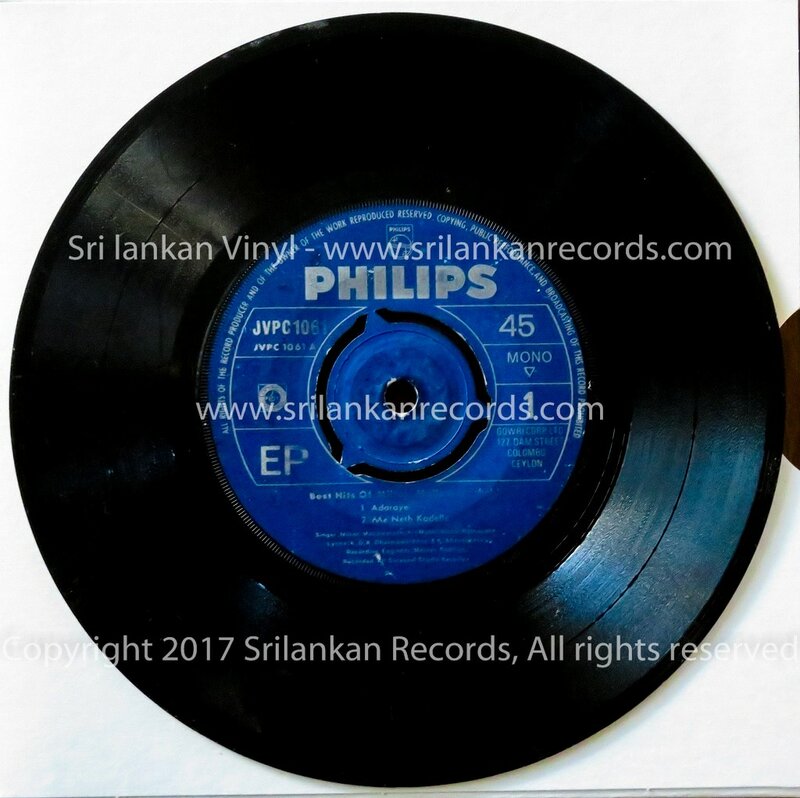 The legendary record producer Patrick Corera produced Milton Mallawarachchi's first Gramophone records in 1969. These gramophone records produced under the Philips label (EXVEE JVPC 1016 & 1017). And these two Gramophone records are very valuable piece of history produced by Philips. Also these gramophone records extremely hard to find. Listen to these original recording and music done by Mohamed Sally. Also Milton's first ever EP again produced by Patrick Corera JVPC 1051 followed by JVPC 1057,1061 & 1069. These records has significant importance to Milton Mallawarachchi's musical journey. They all were very popular back then. There were many EP/LP records followed by his success after those records. Some of most popular labels are Biswa, Gemtone, Silverline,Shans & Sooriya who produced Milton's records. 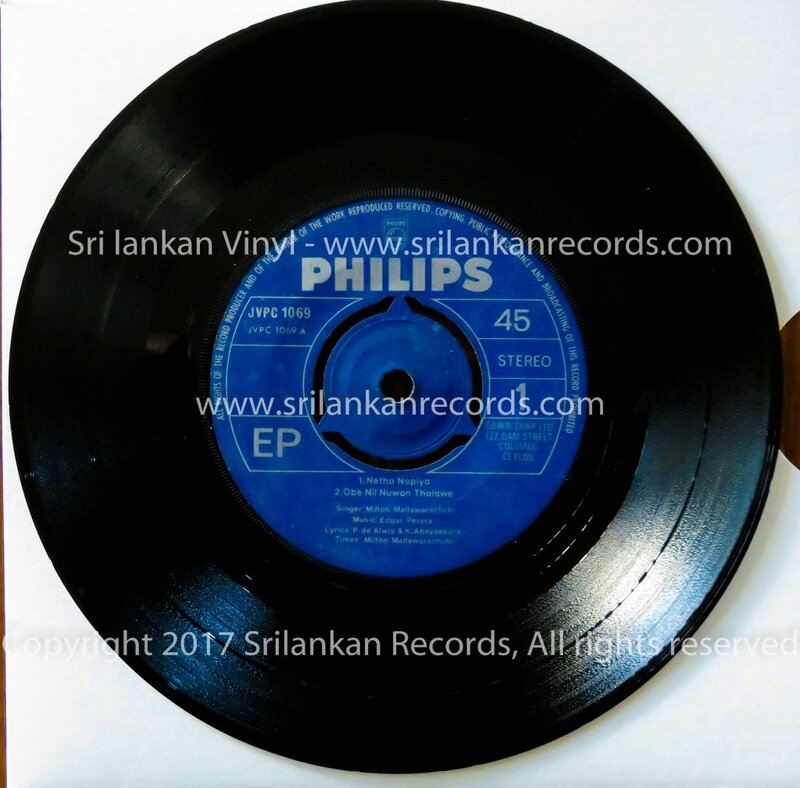 Please check our EP Records section for complete collection for Milton Mallawarchchi's EP records. Some we still in a process of uploading. First ever Milton's LP produced by Gemtone label. This LP includes collection of songs taken from Gemtone EP's. The actual collection of songs in this LP is probably the best collection Milton's songs. This records in good condition is extremely hard to find.